bailey is a London-based artist who balances a classic singer/songwriter style with unique modern electronic pop production. His passion for creative storytelling inspired his debut album ‘Gold’ (2016). 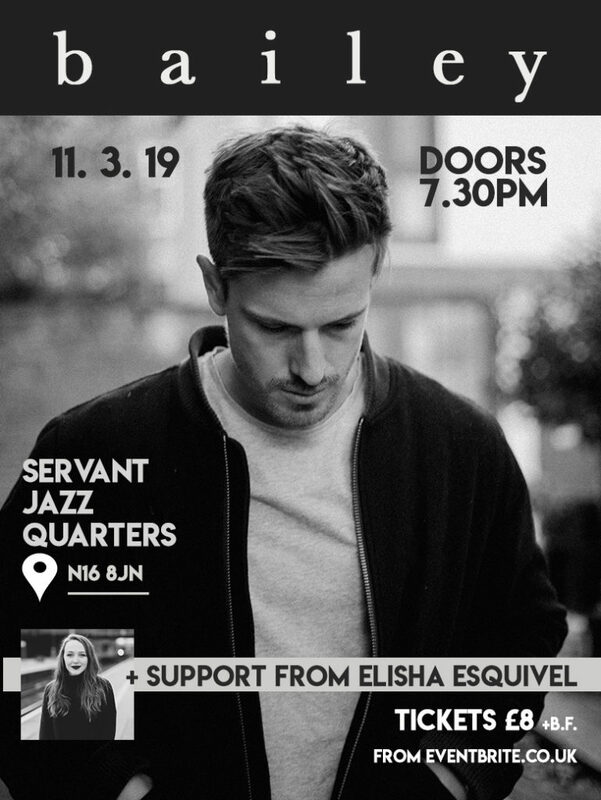 On 11th March he will be playing a live show with his band in this legendary Dalston venue, sharing popular tracks from his album, as well as his recently released series of singles and some new as-yet-unheard music. Elisha is a singer/songwriter whose second EP ‘From The Ground Up’ (2017) won her regular plays on BBC Introducing in the Midlands, and a slot at last summer’s Big Festival. Her music has been described as “remarkably immediate and catchy” with production influences from the likes of London Grammar and Ellie Goulding.